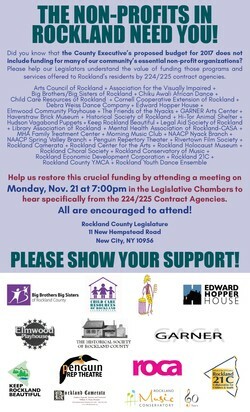 RocklandHistory.org : Press Room : : Urgent Meeting Monday - Please Attend! As you may have read or heard by now, the County Executive’s proposed budget for 2017 again does not include funding for many of our community’s essential nonprofit organizations. The Legislature is able to restore this crucial funding and will decide whether to do so based partly on the outcome of the next Budget Review Committee meeting. All are encouraged to attend! Please show your support!